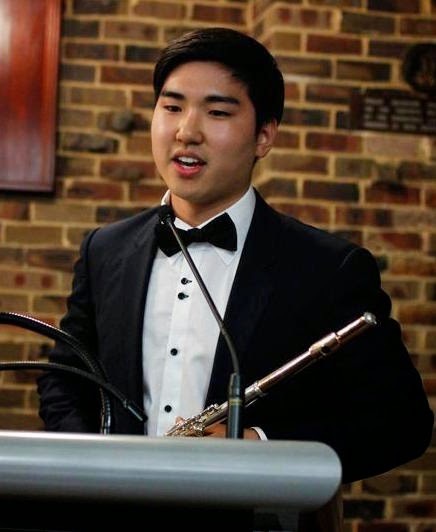 Austin commenced his flute studies in South Korea at the age of eight, and then went on to study flute with Kellie Grennan in Australia from the age of fourteen. He was awarded his ATCL diploma in 2010 and LTCL diploma in 2014, both with distinction, from Trinity College London. Austin was the school music captain as well as the leader of various flute ensembles in his final year at The King’s School, Parramatta in Australia. He received full marks for his music extension course for the HSC, and subsequently a nomination for the HSC Encore. Austin has participated and won in various eisteddfods and concerto competitions in both South Korea and Australia. Most recently, he received a ‘Highly Commended’ award at the 2013 NSW Flute Eisteddfod. He has also participated in masterclasses and lessons with internationally renowned flautists such as Alexa Still and Jane Rutter, and played flute with the Peter Seymour Orchestra (one of the Sydney Youth Orchestras) in 2008 and 2009, and the SBS Radio and Television Youth Orchestra in 2013. He is currently playing the flute/piccolo in North Sydney Symphony Orchestra. As a soloist, Austin performed Carl Stamitz’s Flute Concerto in G Major, Op. 29 with the Bundang Junior Philharmonic Orchestra in South Korea at the age of twelve. Austin is currently undertaking a Bachelor of Medicine and Arts (majoring in music) at the University of New South Wales, where he is principal flute with the UNSW Symphony Orchestra. He plays a handmade Altus flute with a gold Tomasi head joint.